If you’ve ever wanted to eat churros for breakfast, prepare yourself because all your dreams are about to come true. 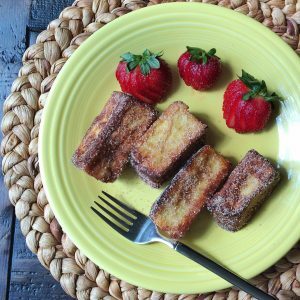 This recipe for churro french toast is one near and dear to my heart and also one of my favorite dishes from my childhood. In the town where I grew up, there was a restaurant we often went for breakfast or brunch, and churro french toast was my favorite thing on the menu. To this day, when I go home for a visit, I still order this dish. Now that I live too far away to go home very often, I’ve recreated a version of their recipe that tastes almost identical. They serve it drizzled with a caramel sauce, making it even more decadent. Make no mistake—churro French toast is not a healthy dish by any means. It’s absolutely indulgent. But I guarantee if you love churros, you’ll love this recipe. And this dish is sure to be popular with your kids since it’s got a pastry-like quality to it that’s so delicious and sinful, they won’t believe you’re serving it to them for breakfast. I like to serve this dish with sliced fruit and when I make it at home, I usually prefer to forgo the caramel sauce or syrup because it’s sweet and decadent enough without any syrup for me. A child-size serving is two sticks; three for adults. I can’t be held responsible if your family never wants to eat anything else for Sunday breakfast again! To make your own cinnamon sugar easily, just measure out the amount of sugar called for in the recipe (I like Zulka brand Mexican cane sugar) and add ground cinnamon a half-teaspoon at a time, to taste, until you reach your desired ratio. 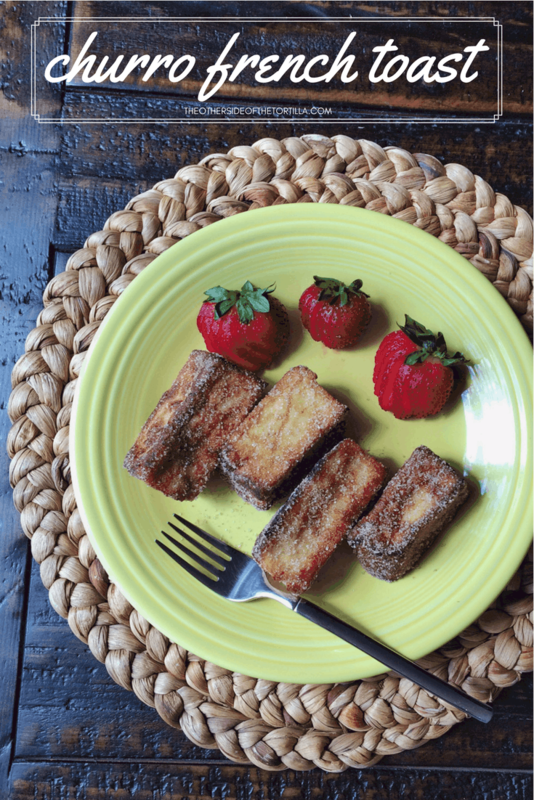 I always use challah (egg bread) for making churro French toast, as it’s what was used in the original restaurant recipe and has the closest taste and texture to the inside of a churro. You can also try using brioche, which has a similar texture, but is less dense. I use safflower oil for frying because it’s a bit healthier choice, and is stable at high heat levels (read: it doesn’t splatter the way other hot oils do when frying, and it doesn’t stink up your kitchen like vegetable oil). I prefer to use real vanilla beans for the concentrated, natural taste. If you don’t have those, in order of preference for substituting, you can use 1/2 teaspoon vanilla bean paste or 3/4 to one teaspoon of pure vanilla extract. Start heating the 1/2 cup safflower oil over low-medium heat in a deep frying pan. Whisk 3 eggs, 3 tablespoons half and half (or milk) and 1 1/2 tablespoons cinnamon sugar together in a shallow dish that you can use to dip the bread. Scrape the vanilla beans from the pod and whisk into the egg mixture. If you're using vanilla bean paste, you can measure out a half teaspoon and whisk into the eggs along with the other ingredients in the mixture. The oil should be warm but not hot enough to fry at this point. Raise the heat to medium/medium-high while you dip the bread in the egg mixture. Dip each french toast stick in the egg mixture, making sure to coat all sides of the bread. Don't leave it in too long, though, or your bread will get soggy and start to lose shape. Transfer each stick to the frying pan and fry until each side is golden brown. While the french toast sticks are frying, put the 1/2 cup of cinnamon sugar for rolling into a shallow dish. 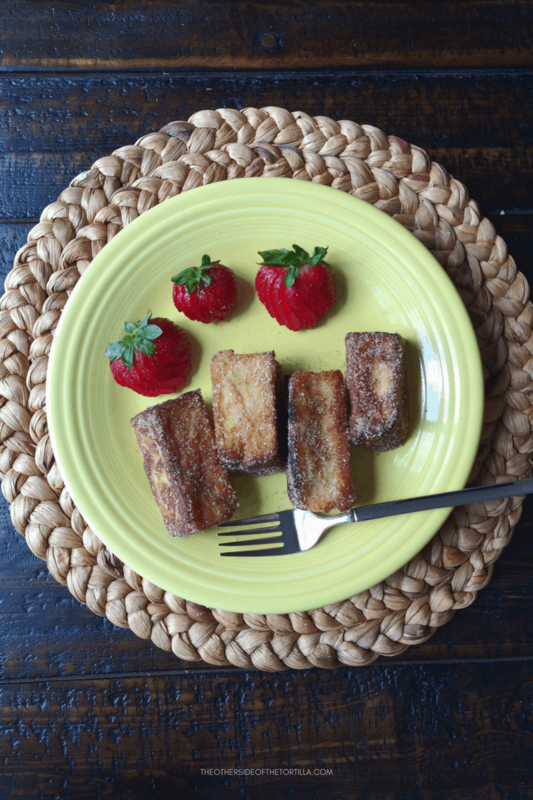 Transfer cooked french toast sticks directly to the cinnamon sugar and roll until all sides are completely coated. Serve immediately. If desired, garnish with fresh sliced fruits or serve with agave nectar syrup, maple syrup or drizzled dulce de leche caramel sauce. I use safflower oil instead of vegetable or canola oil due to its excellent performance at high heat. It also doesn't make your kitchen stink the way other frying oils do, and it's a slightly healthier choice as well. If you have leftovers, you can store them in an airtight container in the refrigerator and reheat in the oven at 300ºF until heated through (about 5 minutes), or microwave for 1-2 minutes at 30-second intervals. This looks sinful but worth it!